What is a size 9D? 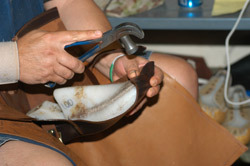 Russell craftsman, Lonnie Gramse, is shown building up a last to allow extra room in the instep as well as the outside edges of the foot. 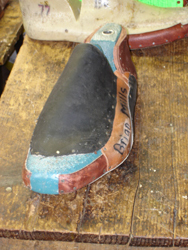 The customer's boot will be built on this modified last so his size 9D's will fit his uniquely shaped foot exactly. As one of the few remaining U.S. shoemakers, and the only custom manufacturer of outdoor footwear and casual shoes in America, Russell Moccasin Company is understandably busy. 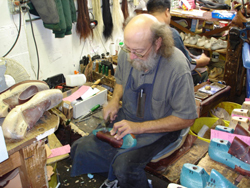 We operate at full capacity year around trying to please our loyal customers, providing them with the very best boots and shoes that can possibly be made by human hands. That's what we do. Consequently, we sometimes don't have time to read all of the chatter on the internet. Sometimes we don't catch off hand comments made about our products at conventions and shows. But something has been brought to our attention that we really do need to address. “A friend of mine told me of the wonders of the hand fitted Russell Boot. I sent for a size chart and carefully measured my feet. The drawings were then sent in with my order, and after a long delay I received my Art Carter Shooting Shoes......MARKED 9D! Believe all the hype you want. It's time to clear up any confusion that might exist about custom sizing Russell Moccasin's boots and shoes. Another example of a built up last. This customer required extra width on the outside edges because his foot was wider than normal. He also indicated he had a painful spot on the top of his foot so that area was built up to reduce pressure in that area. 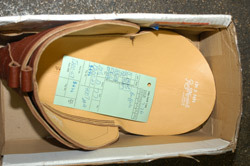 Additionally, the customer wore orthotics so the bottom of the last was built up to allow extra room for his orthotics. A size 9D in a Russell Moccasin boot or shoe could be one of any of 20 to 30 different variations of a basic size 9D. Russell Moccasin makes its products over dozens of wood and plastic lasts...each has a unique shape and configuration. Using your provided measurements our bootmakers fit the size, shape and width of your foot to a basic last...as a starting point. Add a high instep to the equation and we have a whole new picture. Add high arches and the picture changes again. Add narrower than normal heels to the mix and it changes once again. Add thick ankles to the scheme and the last changes yet again. Add heavy calves and the last, cut, construction and design changes again. Throw in a longer than normal second toe, and we have another different size 9D. 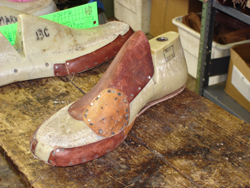 We routinely make dozens of allowances to custom fit any boot or shoe to the shape of your foot and leg to fit your physical dimensions. If you have a hammer toe, we build up the last to provide extra room in that area. Likewise if you have suffered a foot injury that is causing you pain...the last is again modified to provide extra room in that specific area. 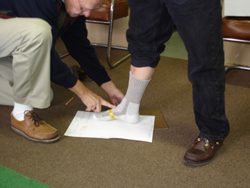 If you wear orthotics in your shoes we build up the last the appropriate amount to allow for your personal type, brand and size and shape of orthotics. President George H. W. Bush recently ordered a pair of Double Moccasin Bottom Zephyr boots from us at the 2006 Safari Club International Convention in Reno. He told us he wore a size 11-1/2 D. We just so happened to have a size 11-1/2D of these very boots in our booth at the SCI show, so we asked the President them try it on. 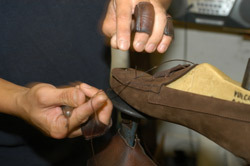 This modified last allows for extra width in the heels and on the sides of the foot, plus extra room over the instep. Yet another size 9D...only different... because no two feet are alike. Russell Moccasin boots and shoes run about a half size larger than what you normally wear. If you wear a size 10 in an off-the-shelf boot, you may well wear a size 9-1/2 in a Russell. 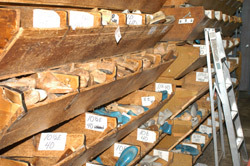 With certain styles, such as those with molded soles or triple vamp designs, your standard D width may to a C or even a B width in a Russell. These decisions are made during the custom fitting process. President Bush's size 11-1/2E Zephyrs will have had a number of modifications made to them, beyond going from an 11-1/2 D to a size 11-1/2E and EE, to make them a perfect fit for the size and shape of his foot. Are we pandering to the President? Not at all. Every order at Russell is given the same consideration and attention to detail. Our aim is to please you and make your feet happy. For if we don't, you will never order another pair of custom fitted shoes from us again. That would be bad for business. And we would like to stick around for another 108 years! So why was size 9D stamped in the internet customer's boots? To provide a basic road map for resoling. It's as simple as that. 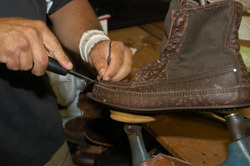 When he wears the soles out and returns his shoes to us for resoling , our repair department will immediately know which size sole to select to resole his boots. And if the size that was stamped on the inside of his boots is worn off and we can't read it, we go to our original order files and pull out his order. 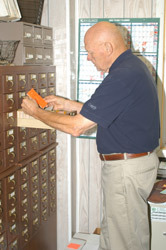 We keep them on file for 10 years! At Russell we make every effort to provide you with a perfect fit. That is why we require a tracing of your foot plus six to seven key measurements to to determine the shape and size configuration of your foot. That's just for starters. If you have any foot issues, such as a painful area, hammer toe, high instep or wear orthotics, we address these issues and make allowances for a perfect fit. What happens if “John Doe” sends in two pairs of boots for resoling...one pair is a size 10-1/2 D and the other is a size 11D? A red flag goes up immediately. We then consult the orders in time/date order. We might discover Mr. Doe's feet have changed since his original order and he now wears a size 11D. His older size 10-1/2Ds probably still fit because they have stretched with wear. But just to make certain, we normally contact the customer and ask. We hope this clears up the custom fitting questions. A size 9D could be one of 20 or 30 or even 40 different configurations. Given deformities, bunions, longer second toes, high arches, high insteps, hammer toes and injuries...a size 9D could be one of hundreds of thousands of size 9Ds. Everybody's feet are different, even within the same size parameter. Is there any perfect size 9D? Absolutely not! The perfect size 9D is the one that was built to fit your specific foot. Size 9D is just the starting point at Russell. Just of few of our lasts. These lasts are used as a beginning point. If the customer's measurements show the need for building up the last to allow for a hammer toe, the last will be modified. The customer information tag, which carries the order information, (type of boot or shoe ordered, leather type, sole, measurements, etc.) follows his or her order all the way through the manufacturing process. Each of these tags, containing the customer information, is kept on file for 10 years, allowing us ready reference to each specific customer's orders.